Google (parent company Alphabet) has been one of the most valuable companies in the world for many years. Recently, they released Q2 2018 earnings. Revenues grew 26% quarter-over-quarter. That is incredible given their massive scale. Nicole and Jon talk about how Alphabet spends money to feed one of the most powerful business models ever created: search advertising. Can Alphabet ride the Google cash cow to sustain their position as one of the most influential companies in the world over the next 20 years? - Nicole's ongoing frustration that every year, for the last 10 years, has been labeled "The Year of Mobile"
Nicole and Jon believe that Alphabet is well positioned to continue as a dominant force in tech and society at large. No major indicators show competitors have the ability to execute on small parts of Alphabet's business undertakings such as Google Maps. With search advertising and Google becoming even more of a part of people's lives, it's important to question what will Alphabet do next? What more can they do to continue to innovate and push the limits? The decisions they make over the coming years will create ripples that affect nearly every business that exists today. 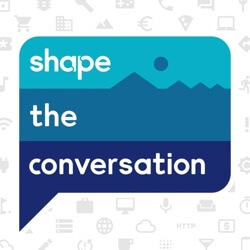 And this is our podcast Shape the Conversation. Jon and I work with a great team here in Shape.io headquartered in Bend Oregon. And just some history about us, we left our agency jobs as marketers to build software for digital advertising teams. On this podcast we'll be talking about working in marketing and growing Shape.io. So Jon, why should you listen to us? Yeah why should you listen to us at all? That's a good question to start out podcasts with. Probably. We're a software company that's been able to get to profitability, which not every software company has scene. We've kind of had a little bit of a mix of being bootstrapped for the first couple of years we were out there and then going out to raise money and some perspective there. 2015 we put together a seed round. Outside of the Silicon Valley bubble which always is a little bit of an interesting outlook to have and broadcasting from Bend Oregon outside of that Silicon Valley bubble is even an interesting niche within that. We're like adjacent to the Silicon Forest but not quite there. That's true. Portland is pretty hot these days for sure when it comes to the tech scene. So what are we going to be talking about on this episode, Nicole? The biggest company in the world? No probably not the biggest company in the world. That's a good question, I'll look it up. They've got to be in the top five biggest companies in the world. But we're talking about Google and as two people that have spent a lot of time as digital marketers primarily focused on digital advertising that occurs within the Google ecosystem it's a company that, outside of Shape, has definitely influenced my life more than any other one I think. We kind of got the idea for that topic to do a little bit of a deeper dive on Google for a couple of reasons. One, we recently put a blog post out there. No big deal, my career best Tweet actually was a result of this blog post too. I look forward to tell my grandkids about my heroic tweeting back in 2018. But I wrote a blog post that talks about the best analogy I've ever heard about Google's business and business model and I heard it back in 2013. You've heard me tell it many times over the years but it's still the best analogy when you're thinking about Google, I think, that is out there today. I would agree. So you want to tell us a little bit more about what this analogy is? Go back a little history, Horace Dediu, he had a podcasts, I kind of have fallen out of listening from it a little bit, called the 'Critical Path' he's moved to focus on a lot of other things and he has spent a lot of time thinking about big macroeconomic changes in tech, a lot of time studying Apple. And one episode back in 2013 he kind of turned his lens for part of the episode to Google and he went through this analogy for how to think of Google's business model and how they make decisions, and as somebody that day to day was spending my time running ads on Google for clients, it really struck me to think about how Google's strategy can be boiled down to really this analogy. So it's the analogy of kind of thinking of Google's business model as catching fish at the mouth of a big river. So a couple components to it. Google for people maybe not as familiar with Google can kind of be broken up into two categories of business units or in terms of revenue sources really two basic categories there's... or for Alphabet the parent company really there's like google search business and not Google and everything owned by Alphabet, Nest, Waze now is owned by Google. All these companies that are under Google... or under Alphabet, sorry, they all kind of just feed off of the revenue that Google is bringing into the rest of these companies within Alphabet and the primary driver that is search advertising. And Google actually just recently came out with their Q2 earnings report which will go through a little bit because it's got some information on it. But basically search advertising, when you Google something an ad pops up and somebody clicks on it, that's really the most powerful revenue generator that's been created in modern business history in my opinion. I can't think of anything that would rival it. Yeah they've created a situation where everybody is winning. The person searching is getting great information, the advertiser is putting their ad in front of somebody that just searched for that click, and Google is definitely winning probably more than anybody else in this scenario. But they've built some incredible technology and using Google is a great experience. So back to the kind of thinking about the river analogy, generally people the more time they spend online the more time they're going to be Googling. You know if you spend two hours a day online as opposed to one chances are you're going to spend more time googling in two hours than you are one hour so thinking about Google is this river fish kind of flowing through it and these fish are all the searches. So people type something in to Google hitting return there's your fish flowing down the river and they're going down this river and at the end they hit this net and that's Google search bar. And that's where Google's monetizing all these searches everybody using the Internet. There's a few ways that you can sort of increase the amount of fish that are hitting these nets and the most effective way to do that is really increase the amount of water in the entire ecosystem upstream that makes the river run wider, collect more fish, be a habitat for more fish, runs faster, gets more fish to their nets quicker, and that's the way to think about Google that Rivers kind of like internet use and people spending time online searching is that current pushing people through to their net. So Google- Alphabet really it's so hard to say Alphabet over Google. Well just remember too, it's Google ads not AdWords. Just to make it more complicated. Back to kind of like Alphabet making big decisions about what they need to do these big bets are to essentially make it rain and increase the amount of water flowing through this ecosystem. So the simplest example I can think about is autonomous cars. So you look at all the billions and billions of dollars that Google's dumping into autonomous cars the millions and millions of now lawsuits that are between Uber and Google related to technology theft with employees trading. All this trouble they're going through to build an autonomous car, why is Google placing these bets? And that is really tough to see if you look at that from, why does this essentially media advertising company worried about building a car? Well it feeds the strategy of making it rain and feeding the ecosystem because what are you doing if you're driving your car? Paying attention to the road. You should be paying attention to the road. You listen to a podcast. You have passive things that at least you can stay focused on the road. One thing you're not doing is Googling. And if you're not googling, Alphabet can't monetize your time essentially during that. So Google really wants to think about autonomous cars because now if you don't have to worry about driving for that hour long commute that's another hour you're spending on the internet and just the sheer fact of you being online means you're going to use Google more. I would just love the concept of it like four or five hour road trip without having to drive one bit. That would be amazing. That is a future that, I've got a two year old you've got ten month old, that's a future they're probably going to live in in a lot of ways. We will probably live in at some point. You see we're Tesla's going and with companies like Google that one of the things is like the reason they also make all these other big bets is because they have so much money flowing in through search advertising that they can't spend it on just improving the search tech like there's too much money coming in, they can't spend it all on just tech. They have to think about these other ways, they have to be creative. They have to literally think about how can we get people using the internet more? So Google Fiber going to entire cities and saying, "Hey look your entire population you now have free fast internet." Well and I, along with Google Fiber I mean adjacent again but not necessarily tied to it, isn't Google the one who's doing weather balloons or tried the weather balloons to bring internet to small rural populations across the world? I think you are talking about Project Loon and that was Facebook but same concept. You can look at Facebook a lot of the same way I think Facebook has a very make it rain strategy too. The more time you're spending on the Internet the more time you're probably going to be using Facebook. I think Facebook just recently this week as we are recording July 2018 last week they announced plans or did launch a satellite to help improve, like you're saying, Wi-Fi to these rural areas so these massive tech companies like Google and Facebook are trying to think about how we make it rain and essentially that rain in this analogy is just getting people to use the internet more. So like the result of that is some pretty incredible numbers and results that Google continues to report in quarterly earnings if you will get their stock price, it's higher than it's ever been. Continuing on and up and to the right curve for a company at Google scale that's really impressive. Yeah. So as of a couple of days ago shares of alphabet up 4 percent because they know just managed to report a revenue of twenty six point two billion dollars and that's up from even the twenty five point six billion that they were supposed to hit. The really interesting thing to me about some of these statistics is you talk about net revenue, but one of the things that you know Jon mentioned the other bets that they have they specifically report on this and the revenue is one hundred forty five million dollars for this time period. OK. And that's up from 97 million. So that's great. Good job Alphabet. The operating loss, Seven hundred thirty two million. So let me repeat this 145 million in revenue seven hundred thirty two in operating. Where are these gobs of money going. Oh yeah like all of the river to make it rain inducing project. Yeah they're willing to lose massive amounts of money on these endeavors because the revenue from those might be accounting for 145 million but they're kind of playing like 4-D Chass right. Like their twenty six point two billion that they drove. That's the money that they're they're focused on. And this is kind of a critical threshold. It looks like probably 2018 will be the first year Google tops 100 billion in revenue for the year. And that's still beating analysts expectations. The power of search advertising and the power of Google to deliver great experience to people is still producing gains that even Wall Street is surprised with. Now 15 years ish into their run as a public company 10 15 years into their run as a public company that's incredible at their scale. Their revenues are up, we are reading a Business Insider article that we're kind of referencing and the revenue continues to grow an incredible rate 26 percent increase revenue for even the previous quarter into summer months which are traditionally a little slower in e-commerce in spots and yet paid clicks on Google ads increased 58 percent year over year in Q2 and the amount of money Google received on those average ads actually fell 22 percent. You know mobile clicks are cheaper a lot more the percentage are coming from mobile clicks but if you're increasing overall 58 percent you know 22 percent of average actually just means advertisers are now even more excited about your service because you're getting cheaper clicks than you were. What in business though is the price going down for? I agree it's so funny though because a lot the conversations on Twitter and you know some of the PPC communities you always hear about how this new thing is coming out Google's was doing to increase revenue. And then you see a statistic like that and it's a little counter-intuitive now overall yeah I mean that's what you see that 60 percent increase in revenue. It blows my mind too that it's still, since it's been the year of mobile for going on ten'ish year now, that they still credit their mobile advertising business as driving so much of their growth. That's nuts to me. I'd say the biggest question Wall Street had of Google and Facebook over the last five six seven years has beed can they withstand the mobile revolution? Definitely Facebook. A little bit more than Google that question but that is definitely the core question at the heart of Facebook you know starting 2012 13 and they've crushed it. They've destroyed any hesitation any investors had on it. You'll see you know pretty much recommendation of a strong buy from any investors out there on those because they've really solved a lot of those mobile problems that people weren't sure if they were going to be able to. I'm just you know assuming that we eventually get to the end of this is the year of mobile idea too I'm really intrigued to see where those next major gains are because we know like eventually you are going to top out. I mean there's still what I think it's hearkening back to the Mary Meeker podcast we did like 50 or 40 percent left of world wide market saturation for mobile phones left. So eventually we're going to hit you know a fair majority. Over whelming majority. Like half the world still doesn't use the Internet routinely. So once you get there though then what's what's that next step and one of the interesting things you said is Google just basically can't throw all of the revenue that they're making from Google ads back into Google ads. What does the future of Google ads look like as opposed to all these other bets? They're really forced to make these crazy other bets. If they didn't they would just be hoarding cash at an obscene amount. They're still hoarding cash even during Q2 they were fined five billion by the EU and they paid their fine and this quarter they still made only a small amount less than they did in profits from Q2 2017 without paying that 5 billion dollar fine. So there's still incredible amounts of searches being done. I remember going to Google's headquarters down in Mountain View and sitting in one of the waiting rooms for my contact to come out and in the background they had a video screen that was a real time just kind of like firing of searches that were happening around the world. Just the key term that was going in and I'm sure they don't do this anymore but it was a firehose you couldn't even believe how fast and just the time we started recording this, there's been millions and millions of searches and ads shown and people have gotten information and still what's the recent stat on the amount of unique searches out there? I can't rememberm, it's insane. It's still something like 15 to 20 percent of all Google searches have never been searched before in that exact way. And that is crazy. I thought it was crazy when two three years ago it was still at 33 percent. You think about all the people that are Googling all the stuff that has happened now like for that number is still be 15 20 percent of all of what's being Googled has never been Googled before. It shows that still the the vast opportunity that Google has ahead of it and how this search advertising business unit will just continue to spit off these incredible revenues. Well and we've talked about this before. You know especially as voice search becomes more prominent it's not huge yet but you know as it grows or something like VR search grows the queries that we may get in the way that we make them are going to change and it's going to spawn continued development continued interest. Now I still love my search ads. I don't know if I can ever get those up at Google to take away my keywords to be really sad but you know it's really exciting to be part of this industry and seeing where it's going. Yeah and I think the future of search ads and where those go, they do put a lot of resources back into them. I think a lot of marketers and maybe a listener of this would wish there was a little bit more put into it you know and a little bit more deeper you know customer support at times on the agency side for some people from Google but you know they're going to continue to push the envelope on Google ads. If you told me they were going to remove the right rail side ads down the right and it would only improve performance and be a great change... it's crazy to me like they are continuing to innovate google maps the Google CEO referenced in the earnings call Google Maps and what an unbelievable resource that is and think about that like think about the power that Google Maps has and what they can tap into there that if you're going to start trying to replicate that from day one today how do you even begin? How does another company even begin to come in and disrupt Google Maps and Apple Maps? Apple's trying. Apple has one of those other companies with so much money coming in from their hardware sales they got to find somewhere to put it. So they put it in the maps. That's one of their projects. But to me nobody's better positioned to really execute on whatever comes next than Google because they've just got so much firepower. Can you remember this from the update to, don't look, how many employees currently work at Google? We'll give a little pause so everybody can guess but current employee headcount at Google today July 2018. What do you think? Yeah you read it. OK.
Eighty nine thousand people work at Google. That's up from 75,000 people at this time last year. So over the last 12 months they've onboarded 15,000 new Googlers against the world probably some of the best and brightest from Stanford computer science programs all across the country. They're still in awe. Yeah. Good point. There is an off to working at Google especially in the engineering end. I'd love to know how many of the 15,000 is engineers I bet you we could dig in somewhere and find that. But the point being that Google continues to push and bring all great people and have search advertising as it's magic money generating machine that can feed all these other crazy bets and let Alphabet do almost whatever it wants. So I just really don't think I'd look for any companies to unseat Google over the next five 10 years for what they're doing which is still indexing the world's information online presenting its people in a search. I think there's some ways people could begin chip away at that. But I think my take away from you know continuing to think about Google's business model is that it remains surprisingly unchanged because it's so consistent and solid and puts them in a great position to continue to control their destiny in a way and be one of the biggest companies in the world. I'd be very surprised to see them unseated from too many companies growing bigger than them over this next 10 years. I think the one thing you can watch out for is maybe some international companies Baidu index. We're talking about US, we're talking about world Google's biggest company like but is there is there someone who can come up? I don't know. I would just like to disagree with you because I can. Yeah I think you know somebody in 2008 right if they were looking at this and they said, I hate to make predictions like 10 years out because there's so much can change. But 2008 it probably whould have been said "oh it's naive to think they can maintain this for ten years or the superpowers for 10 years it's always change or whatever." But if you pin down there are examples of the largest companies in the world staying on that list for 60 70 80 years and we're still very much at the beginning of the Google/Alphabet story. They were still a Stanford research experiment just a little over 20 years ago. So there's still a lot to be accomplished I think in the eyes of their executives. Absolutely. I think we'll leave it with that. All right. Sounds good to me. So as always rate and review. Find us wherever you get your podcast. We can't say we've no longer gotten a review. We've got some reviews on there. Thank you, quesobob I believe will live in infamy as our first review there on iTunes and check out the blog for show notes we'll put up any links that we talked about. That's at blog.shape.io/podcast. The other thing let us know, I mean what do you think Google's going to do next? Where do you think they should throw their bets? Do you have an idea to pitch them? No I'm kidding. I'd just be interested to hear if anybody has any thoughts you know beyond what we've just babbled on for 25 minute. Reach out to us. We love talking Google thinking about how they are going to affect our world going forward and what that means for everybody and how that affects your marketing and what you need to do. Until next week over and out. From Bend Oregon.